"We had a great morning on the water yesterday. Thanks for making it (our boat rental) all so easy and enjoyable. We will be back! "Just wanted to say enormous thanks for the wonderful fishing trip on Monday evening. This was the "perfect" end to the most memorable 10 days in Florida, and simply the best days fishing of a lifetime! Pure Magic, we shall return. PS - We ate the Black Drum at the Ritz Carlton the very same evening!!! "My family and I would be there every day, if it wasn't for the fact that we live in England :( But hope to be over, as soon as humanly possible!!! "I took the sightseeing tour on the Double Sunshine and really enjoyed it. The narration was very informative and the crew was very friendly. As advertised, it lasted 1.5 hours. The boat is pretty big and has bathrooms, drinks and snacks on board. The mansions of Port Royal are pretty spectacular but the best part were the dolphins that seem to enjoy the boat's wake and were very playful. The cruise was very relaxing and a great way to see Naples and Port Royal from the water. They even go out into the gulf of Mexico before they make their way back to the dock. 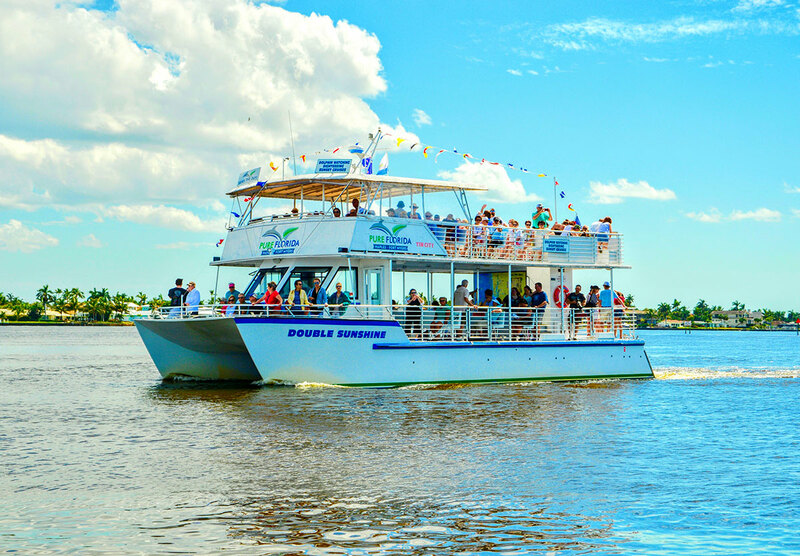 "Our sunset cruise was so much fun! The boat was roomy and comfortable and the staff was very friendly. The narration was interesting and the scenery was spectacular - from the impressive homes to the wildlife and the beautiful sunset over the Gulf. I wish our photos of the dolphin playing and jumping in the wake of the boat had come out so I could share - they were having as much fun as we were! It was really cool to watch them play at such close range and for several minutes at a time. Our whole party loved the evening - this was a truly unique experience for locals and visitors of all ages (my little boy was in heaven and so was his grandpa!). "Tried out the Double Sunshine last night for my first time cruising around the Naples Bay. My mother (who we were visiting) somehow found coupons for $10 off which I recommend trying to find. The boat was comfortable with a bottom and top deck. It was a cold night, but the company supplied blankets which appeared to be clean and were definitely needed late into the boat ride. We tried to go out into the golf, but the captain decided it was too choppy and for safety reasons, brought us back into the bay for the sunset. Being someone who doesn't get seasick, I was slightly disappointed, but happy to know that they are worried about people's safety. The sunset was gorgeous and our captain made sure to sit in a suitable viewing spot until it was completed (we almost missed the final seconds as another boat was trying to move in the way of our view). Overall, it was a great tour on a decent boat and a beautiful way to watch the spectacular Naples sunset. "Absolutely do this! I visit Naples 5 times a year and always take this amazing cruise. I recommend taking the sunset cruise. Always breathtaking to me and whoever I bring along with me. Be sure to sit on the top deck and look for Dolphins as you leave port and along the way. The best part is hanging out and watching the sunset while listening to some Jimmy Buffet. Wait til you see the beautiful homes you'll see on your way out to the Gulf. "A Must-Do in Naples. 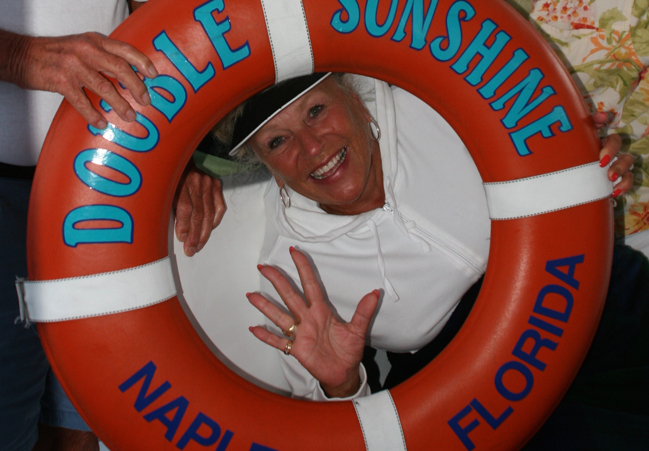 We love the Double Sunshine tour! We take all our friends who visit us in Naples out on this boat. We/they love to see the beautiful homes, the mangroves, birds and dolphins. We haven't ever missed seeing dolphins on this cruise and they charm everyone. We have found the cruise to be popular with adults and children alike. Don't miss it! "Very enjoyable sunset cruise. We asked at our hotel for a suggestion of a good sunset cruise and they suggested the CruiseNaples cruise on the Double Sunshine. They offered discounted tickets and even called to make the reservations for us. I would suggest asking at your hotel if they have discounted tickets or look for coupons in the many Naples' Attractions brochures found throughout the city. We were very pleased with the tour in spite of the sudden shower that drenched us on our way out to the Gulf. We were sitting on the top deck since that had been recommended to us when we picked up our tickets. After getting drenched we went downstairs to the covered part and realized that there is also a great view from there. The tour was very informative. As we cruised the captain told us about the area, the different houses we were passing and who lived in a lot of them. On one portion of the tour he had to turn the PA system off and one of the other employees talked to us about the homes. We saw some dolphins in the distance on the way out to the gulf and on the way back a pod of dolphins swam along side the boat for quite a while. Of course, the best part of the cruise was the sunset. I was a little worried that we wouldn't be able to see the sunset due to all of the clouds, but it remained clear in the area where the sun set so we were able to see a gorgeous sunset in spite of the earlier rain and the clouds. I would recommend this cruise and will definitely go again. "this was the BEST cruise EVER!!!!!!!!!! :) If i could give this more than 5 stars, i'd give it a 10!!!!!!!! We had a great time from start to finish. We were up on the top deck, based on a recommendation, and it was wonderful. About a half hour into the tour, we saw a HUGE rainbow, and within minutes it started to rain HARD, but we were having so much fun getting wet from the hot weather, that we finally decided to go downstairs. Eventually, the rain stopped, when we went to the part of the river that you could see the houses. Then we saw the most beautiful sunset, and we even saw a family of dolphins racing along the boat, and some of the dolphins went up very high that everyone was clapping and cheering. Capt. Steve knew how to keep our spirits up even with the rain. I'll definitely be back. "Great cruise! We had the 1.5hr tour leaving Tin City. Very relaxing tour of the waterways. Professional staff, Cap'ns Neal and Rick. Informative and entertaining. A great little trip if you're looking to cool off and relax for 1.5 hrs. Regular daily cruises at a very reasonable price. Cap'n Rick even told us to pick up a map 20 yards away in order to get discount vouchers off. He didn't have to do this and the gesture was appreciated. "Bay fishing with Captain Chad! We went out on Saturday and Sunday and we had the best time ever. Captain Chad was awesome. He is friendly and very knowledgeable. We got so much mackeral that we had to give some away. He was very good with the kids and told us where we were going and we didnt have to move around at all... it was great. Will do it again in a heartbeat with Captain Chad.